We know that God has called us to this community. 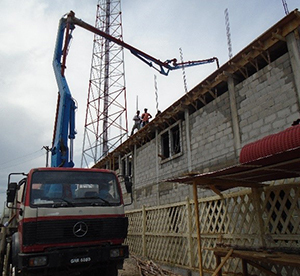 GO's Youth Learning Centre is the first building of its type in #71 Village that offers a variety of services. It is exciting to see the children and parents of different religious backgrounds come for the many programs. 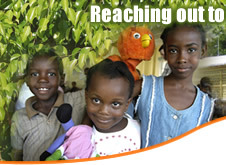 GO's presence and help to the community is very much appreciated here. If you were there, your heart would be touched. It is our hope and prayer that you would consider helping us. We still have needs before we can accommodate teams in our new building. Before our renovation, accommodating teams was difficult. 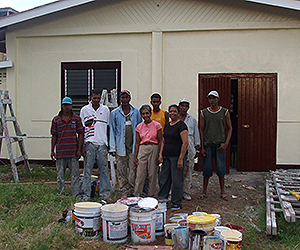 For example, a team of 11 from Trinidad was in Guyana, but we had no place to house them. They spent one night at an apartment, but had to be moved because there were huge rats running around. Not only food, but clothing had to be packed in the refrigerator to prevent the rats from further destroying the baggage. 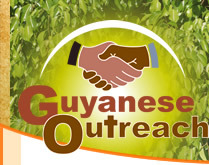 Accommodating teams is very important for Guyanese Outreach's work. We need to furnish the bedrooms with beds and other furnishings. We need a commercial size stove with an exhaust system, a large refrigerator, freezer, and ceiling fans. We need a large generator. We need to paint the interior and exterior of the building. We are thinking about how to add solar panels which will reduce our huge electrical bills and permit more rooms to be air conditioned. The summers are unbearably hot in Guyana. What an opportunity that God has called us to co-labor, till the soil; plant seeds; and water for growth to bear fruits for His Kingdom. The harvest is plentiful, but the laborers are few. GO needs your help. Please consider helping GO with a generous donation today! Our renovation included several phases. The First Phase was to restore our leased building. 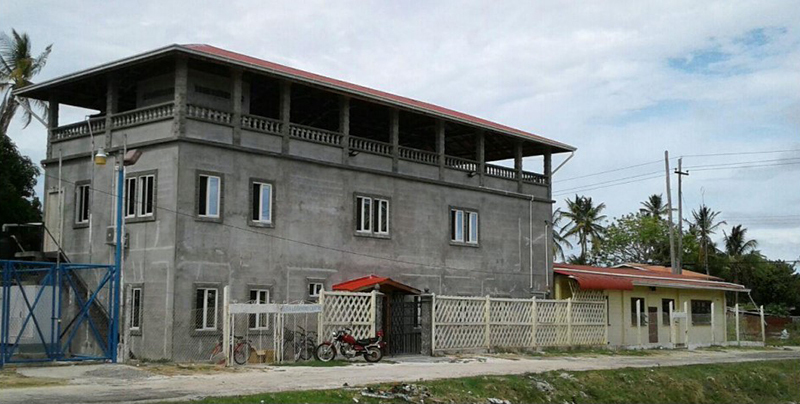 The building had not been used for 4 years. It was approximately 60 ft. x 24 ft. and was basically one large room that we divided into two. All 12 foundational posts were rotted, and were replaced. There were no windows; but, there were lattice walls which brought in a lot of dust. We added windows and replaced all of the doors. God has blessed us with a small grant from the European Union, as well as money from your kind donations, to accomplish much of this basic work. 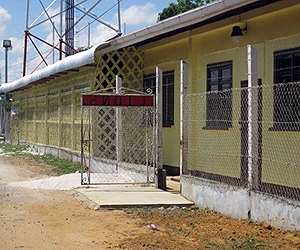 Our Second Phase was to build the connecting tent / portico in the open area next to the building. 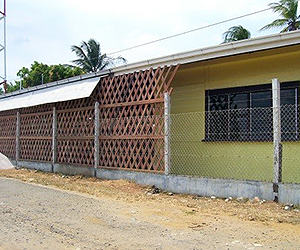 This addition was absolutely necessary to accommodate an expanded classroom. 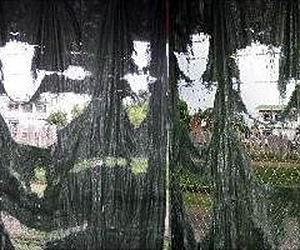 The inside of the tent was protected by tarps, which ended up very torn and tattered. 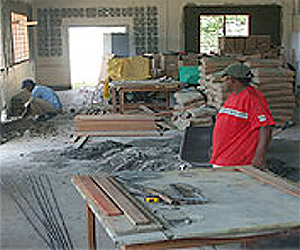 In anticipation for the next phase, the cement floor was poured thinly, so that we could drill as needed in the future. the tent / portico of the new facility! Because of the heavy rainfalls, the tarps needed a more stable replacement. 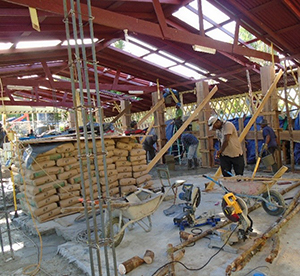 The Third Phase started by covering the sides and ends of the tent / portico with wooden lattice walls. This keeps the rain and sun out of the class room space, which is an open area. The entire building then got a fresh coat of light yellow paint. 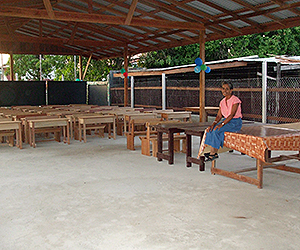 The space is continued to be used as an open area classroom and general meeting room for various community activities. We initially thought the tarps would work, but the weather was stronger than we anticipated. beneficial in sheltering from the weather. 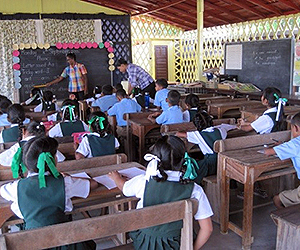 The building was painted, inside and out, which makes a good environment for education. 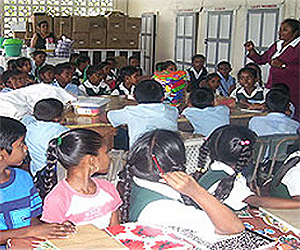 Guyanese Outreach teaches an after school literacy class in the renovated tent. 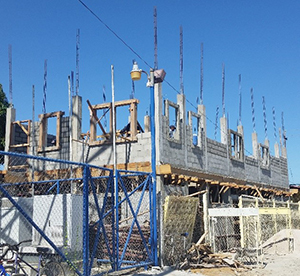 Phase Four was to construct a solid foundation and concrete pillars that will allow us to build a second floor as a permanent home for the computer/math program and a place for mission teams to stay. 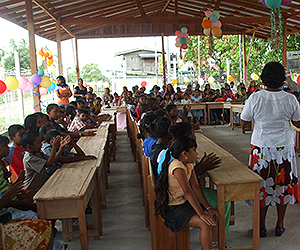 We want to continue to host teams that help with our educational and evangelism programs. To complete this phase, $US 120,000 was needed to be raised. Artist's concept of the Phase Four project. 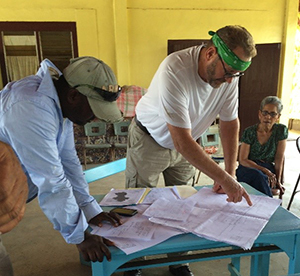 Mark, our US architect, explains the building plan to the carpenter. 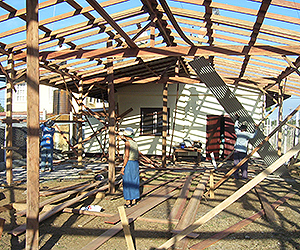 Construction workers remove the tent's roof. 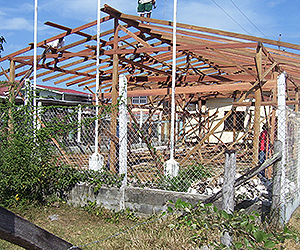 The second floor is being built. Work begins on the 3rd floor/Veranda. 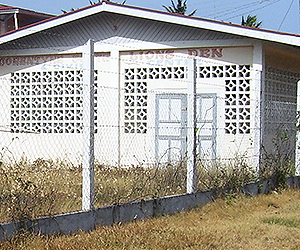 The completed building. It still needs painting and furnishing.